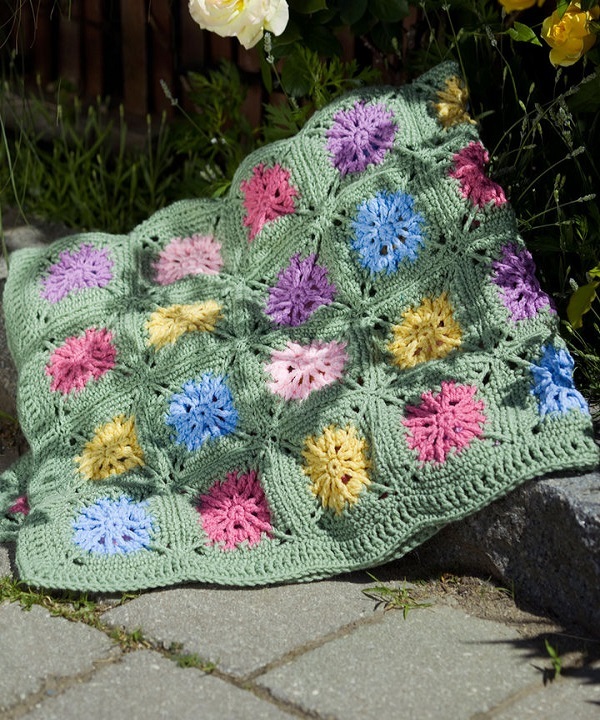 Our Flower Field throw is as colorful as a patch of wildflowers. 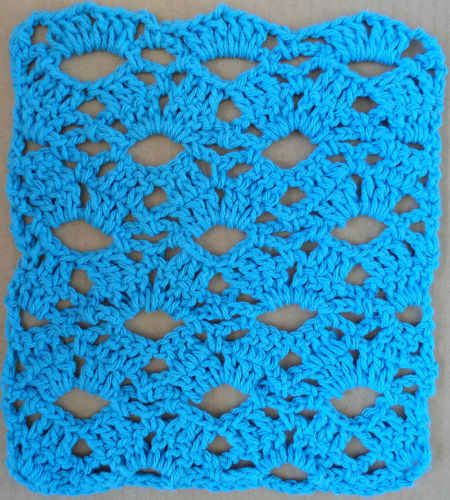 Motif squares are crocheted in Red Heart Super Saver, then arranged and joined to create a field of summer color. GAUGE: Square measures approximately 5″ across. Throw measures 45” x 49”. NOTE: Beginning chain-3 counts as first double crochet. 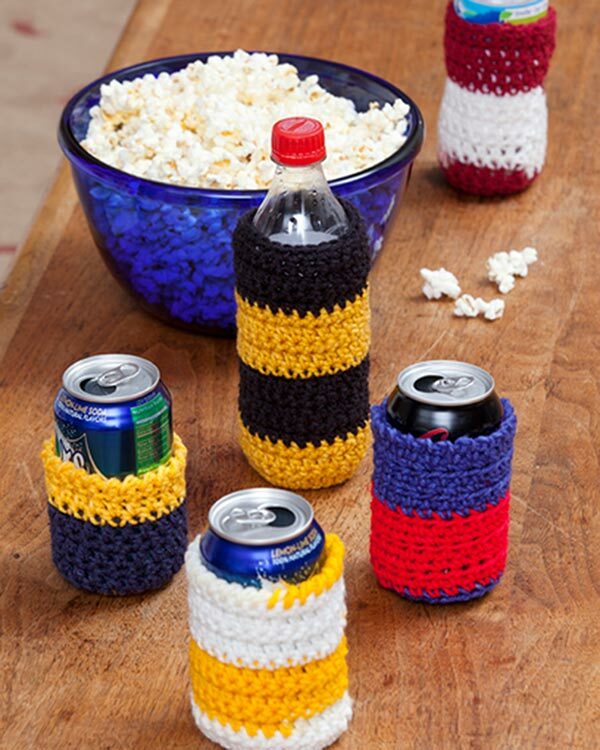 Join with a slip stitch unless otherwise stated. Beg CL = Ch 2, *YO, insert hook in sp indicated, YO and pull up a loop, YO and draw through 2 loops on hook; repeat from * once more, YO and draw through all 3 loops on hook. CL (uses one st) = *YO, insert hook in st indicated, YO and pull up a loop, YO and draw through 2 loops on hook; repeat from * 2 times more, YO and draw through all 4 loops on hook. NOTE: Make 14 each using CA, CB, and CC; 15 each using CD and CE. Ch 4, slip st in first ch to form a ring. Arrange motifs in 8 columns of 9 squares each. Whipstitch together with right sides facing each other. Rnd 1: Join CF with sc in middle tr of corner starting a short side. * Sc evenly across to corner, 2 sc in middle tr of corner. Repeat from * around, slip st in first sc. Rnd 2: Ch 4, (counts as first tr). * In middle sc of sc-3 corner work (tr, ch 1, tr, ch 1, tr). Tr in each st across to next corner. Repeat from * around, slip st in fourth ch of beg ch-4. Rnd 3: Ch 1, sc in same st, sc in ch 1 sp, 3 sc in tr, sc in next ch 1 sp, * sc in each st across. Sc in ch-1 sp. 3 sc in middle tr of corner, sc in ch-1 sp. Repeat from * around twice more. Sc in each st across, slip st in first sc. Fasten off. Weave in ends. 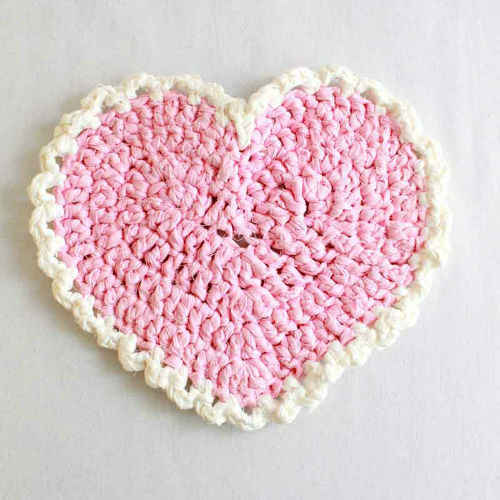 approx = approximately; beg = begin(ning); CA, CB, CC, CD, CE, CF = Colors A, B, C, D, E, F ; ch = chain; dc = double crochet; dec = decrease(s)(d)(ing); fpdc = front post double crochet; fptr = front post treble inc = increase(s)(d)(ing); lp(s) = loop(s); mm = millimeters; pat(s) = pattern(s); rem = remaining; rep = repeat; rnd(s) = round(s); sc = single crochet; sl = slip; sl st = slip stitch; sp(s) = space(s); st(s) = stitch(es); tog = together; tr = treble crochet; yo = yarn over needle; [ ] = work directions in brackets the number of times specified; * or ** = repeat whatever follows the * or ** as indicated.